An international monetary system must have four elements. First, there must be a form of international money usable by countries within the system for clearing residual balances with other countries, in which form reserves against this contingency may be held and with which a country’s monetary authority may intervene to influence the value of its own currency in the foreign-exchange market. Second, there must be adequate institutional arrangements in the form of interrelated banking systems, money markets, foreign-exchange markets and the like, through which flows of international money may circulate within the system. 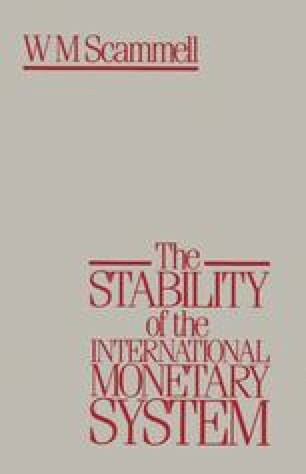 Third, there must exist a method or methods through which the distribution of international money as between countries can be adjusted by acting upon their balances of payments. Finally, there must be some power at the centre of the system to influence the working of international monetary arrangements.